Amazon.com description: Product Description: The 22nd International Conference on Conceptual Modeling (ER 2003) returned to Chicago after an absence of 18 years. Chicago, a city well known for its trendsetting and daring architecture, has met the new century with a renewed commitment to open public spaces and human interaction. Thus it provided a ?tting venue for ER 2003, the scope of which was expanded to encompass all aspects of conceptual modeling in order to deal with constantly changing information technology and business practices and to accommodate a new openness in connecting systems to each other and to human users. The ER 2003 Program Co-chairs, Il-Yeol Song, Stephen Liddle, and Tok Wang Ling, along with an outstanding Program Committee assembled one of the ?nest technical programs of this conference series. In keeping with the tradition of previous ER conferences, the program for ER 2003 also included four preconference workshops, two preconference tutorials, two conference tutorials, two panels, and a demos and poster session. The Program Co-chairs, ÃÂ´ as well as Manfred Jeusfeld and Oscar Pastor (Workshop Co-chairs), Ee-Peng Lim and Tobey Teorey (Tutorial Co-chairs), Avigdor Gal and Elisa Bertino (Panel Co-chairs), and Heinrich Mayr (Demos and Poster Chair), deserve our appreciation for an excellent job. It was a pleasure working with all of them. 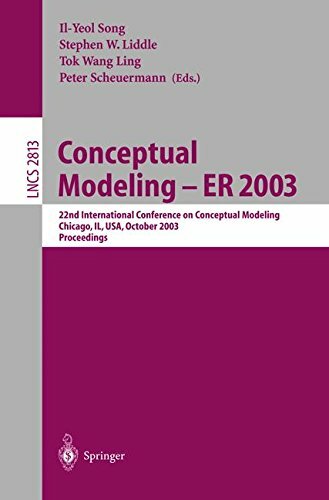 About: The 22nd International Conference on Conceptual Modeling (ER 2003) returned to Chicago after an absence of 18 years.